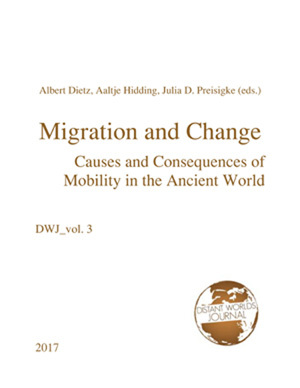 The Distant Worlds Journal (DWJ) is a peer-reviewed online journal that seeks to provide a platform for early-career researchers to present their findings and perspectives on cultures of the ancient world. It has its inspiration in the Munich Graduate School for Ancient Studies ‘Distant Worlds’, which currently incorporates Prehistorical Archaeology, Classical Archaeology and Philology, Byzantine Studies, Ancient History and Philosophy, Theology, Egyptology, Biblical Studies, Near Eastern Archaeology, Assyriology and Hittite Studies, Indology, Tibetology, and Sinology. The aspiration of Distant Worlds is to draw together scholars from a variety of disciplines and to engage in interdisciplinary discussion regarding broader questions surrounding the study of the ancient world. In this manner, the DWJ aims to cultivate a forum with which to engage the wider scholarly community. Each edition of the Journal will be centred on a specific thematic issue that can be engaged in by a diversity of disciplines and considered from a variety of methodological approaches. The individual theme therefore acts as a fulcrum around which a range of individual topics may be discussed. Each paper should engage with the specific theme in question whilst simultaneously dealing with the current issues within an individual specialism or considering broader theoretical and interdisciplinary issues. We envisage that each paper will further the broader dialogue in studies of the ancient world by engaging in critical and shared questions. It is only by the breaking of boundaries that fresh ideas can be developed; through this journal we hope to especially empower doctoral and postdoctoral scholars to voice their views at an international level.